Bedroom furniture made of solid wood for healthy sleep from A to ZZZZ. We make sure you have everything you need for healthy sleep, with metal-free solid wood beds, the ergonomically sophisticated aos sleeping system, and high-quality pillows and duvets. It’s important to us that the materials are natural and provide a sleeping environment that is free from harmful substances while offering optimal support for your nightly regeneration. 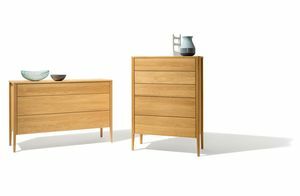 To go with our range of beds, we offer a variety of bedside tables, dressers, and wardrobes that are also made of pure solid wood, with ingenious organisation systems that guarantee convenience and tidiness. Now also available to those who hate camping. Because with our Waldkante wall cladding, you bring plenty of solid wood into your bedroom. Different elements ensure flexible planning and easy installation. You can choose from the wood types alder, oak, and walnut – whichever best matches your bedroom.